The Rotary Revolution event has invited someone to stop in and run the track on Friday night. We probably don't need to mention his name, most of you should know him by these pictures. 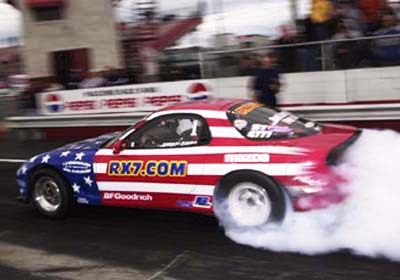 That's right, Ari Yallon from Rotary Performance / RX7.com will be making an appearance on the drag strip during the Rotary Challenge portion of the Rotary Revolution. After that Ari will be packing up his car and heading off for a NOPI event driving through the night to race early Saturday morning. Thanks Ari for agreeing to stop by! There's still time to register online for the Rotary Revolution. Register now and save $20 from the at the door price! Way cool, lets see what a 1.3L can really do.